Choosing a new bike: "A little knowledge…"
Natural aging had brought me to forty three years old, but a lack of attention had taken me to over fifteen stone. One hour of five a side football a week was not enough to keep anywhere near an acceptable level of fitness. So one Sunday in February this year I dug out my rusting Claud Butler mountain bike and after a liberal spray of WD40 I declared it roadworthy, the overspill onto the brakes didn't unduly worry me. The bike had been used for commuting three miles a day over seven years ago and had laid dormant ever since. I went out attired in as close as I could muster to cycling gear which was black tracksuit bottoms, a thick fleece and a beanie hat. I cycled a small loop close to home (which a drive later confirmed the distance as 8½ miles) which was accomplished in around 50 minutes and I was pretty whacked. If this was cycling then I would maybe try swimming. Over a pint in the pub that evening a friend said that he too went out on a mountain bike on short road trips but he had been advised it would always be hard work due to the weight of the bike and width of the tyres. It was then that I decided I would invest in a new bike and not speedos. The next day I was in the magazine section of the city centre library (WH Smiths) and the front cover of a cycle magazine stated that they were on a quest to find a 'decent bargain' bike for £500. This was when I realized that I was woefully out of touch with modern day cycling. I had scraped around various holiday fund tins and kids money boxes and come up with £500, for this I expected to be able to pick from many shiny top end bikes and be treated like a Premiership footballer in a car showroom. Not bothering to read the said article I headed off to 'Cliff Pratt Cycles' which is a well-known independent bike shop in Hull. The price tags I could see dangling from the bikes made me realize that there may have been some truth in the magazine article, nothing I could see had a price of less than £1000. When asked if I needed help I explained that I was looking for a bike to use on the country lanes around my village of South Cave up to a maximum of 20 miles in one go. The first bike I was shown was a drop handlebar Giant Defy – a racer!? I was not a racer! So I was shown a Giant Rapid which looked quite sporty but wasn't a racer. 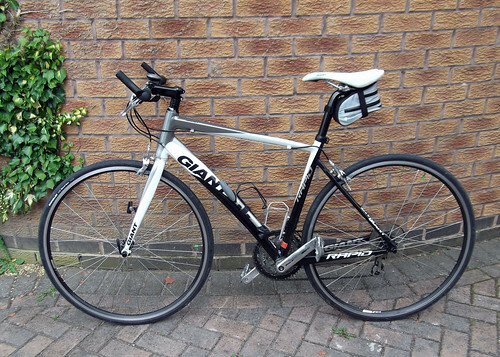 This bike was the magical figure of £500. Although tempted to jump straight in and ride the bike back to work, I showed restraint and said I would think about it. My thinking about it involved going back to WH Smiths and buying the magazine. It was then I learnt that Giant is the largest manufacturer of bikes in the world – I'd never heard of them – my guess would have been Raleigh! Over the next four days I began to research a little bit more and went to another three bike shops, each time giving the same remit for a bike and each time been shown what was clearly a level entry bike. 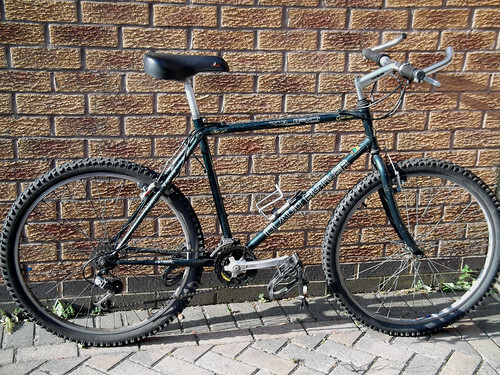 I have to confess at the time I wasn't aware of this – my knowledge was minuscule; the colour of the frame and width of tyres were becoming my measuring yardstick. On the fifth day I stopped my car on the way home from work at Jobes Cycles, another independent bike shop (if I had learnt one thing in the previous four days it was that Halfords were seriously uncool). The shop boasted being a dealership for Raleigh & Giant – my guess at a global superpower and the actual one. I had met the owner on a few occasions as he lives in my village – because of this I felt more inclined to trust his judgment. Wary of leaving yet another shop to 'think about it' or ' I'll call back tomorrow' within five minutes I was handing over the money and arranging delivery of a Giant Rapid. The delivery was quick – Richard said he would drop the bike off on his way home in about an hours' time. When the doorbell rang I raced up from the dinner table and flung open the front door in excitement. The ex-offender trying to make a new start by selling household items from a large sports bag was quite taken aback with the sudden door opening and subsequent change of mood from me. Ten minutes later it was Richard with the bike, but eager not to have my bubble burst twice I let one of the kid's answer the door which means the dog gets out, and the caller is bombarded with questions from five year old Harry – who needless to say was convinced it was his bike. As Richard left and I was in the garage looking at the bike, I was really proud of it. Whilst it was an entry level bike from the worlds' biggest bike manufacturer, to someone whose previous best bike was a ten geared Eddy Mercx pseudo Falcon racer this was a step up. Now I was in possession in what I believed to be the best possible bike, I had read enough of the magazine to realize my tracky bottoms and baggy fleece were not going to cut the mustard. It was a hard choice the next morning to either go into town and buy some gear or go for a ride. It's a male thing but the ride won and I completed the eight and half mile loop in only 40 minutes. That was a whole ten minutes faster than on the Claud Butler, and what's more the bike computer that I'd also bought with the bike was telling me how fast I was going too! With the new toy played with, it was time to drive into town and get kitted out. At this early stage I was planning on going out to ride on sunny days, down meandering country lanes stopping for coffee at delightful cafes which should be a distance of no more than twenty miles. I wanted to be properly attired but I was dreading being accused of 'all the gear and no idea'. The bike shops and magazine had shown me how much cycling wear could cost but I wasn't ready to spend so much [yet]. As a compromise I went to 'Sports Direct' and got Karrimor shorts and a lurid top in 'highlighter pen' shades of black and orange. My current trainers were 'chunky' and as the Rapid had toe clips (I know – but all that would change) I completed the look with a Karrimor pair of leisure shoes brought the total bill to around £25. Not wanting to push myself too much I resisted the temptation to go for two rides in the same day I busied myself brushing off the few specks of dirt I had got on the bike in the morning and polishing the frame. I was hooked! This wasn't going to be a fad to fall in and then out of love with. The train set, the gym membership, classic car renovation, the vegetable patch and going tee-total; these were all one night stands leading to my new true love of cycling. Posted by Francis on September 15th, 2011. It's a great story, Francis, almost identical to our own first purchasing experience. We had exactly the same price expectation, and exactly the same reaction when reality hit us in the face. We simply could not comprehend how people could put down that much cash for recreational diversion. But, times change and we all grow wiser :). Good luck with the Rapid – it's a great looking bike that will give lots of pleasure. But I think we need a glow-in-the-dark photo of that "highlighter pen" top! Good choice. I think the frame is made from Giant's AluxX SL aluminium, used on much more expensive bikes as well, so certainly higher than entry-level. It looks good too. I hope you enjoy it. As regards cycling gear, all I use myself is bib shorts (or bib 'knickers' in winter; they are three-quarter length), helmet, and a windproof waterproof top. The rest is normal T-shirts, overshorts, trainers, etc. I might see you on The Bridge! Aw 'eck, Francis. I've read your letters in Cycle Active so I know what comes next. I'm a complete hoarder, so I've never been able to sell any of my bikes. I'm up to five, and I think that will have to do. For now. Chris wrote: I know what comes next ... I'm up to five. PS: Actually I cheated but I didn't read Cycling Active. (The three dots mean that the next instalment is in production)!! Great stuff. In no time at all, you won't be driving into town, but cycling there. Boy, this story did remind me of my starting out.. weight loss was my reason to lug an old bike out the garage too. Great read by the way. Once a pon a time, to me £500 was a kings ransom for a bike. I must admit, I think you ended up with a good machine for the money. (Now all you need is a big shed to fill with more bikes, a summer one, a winter one, and a mtb of course). Apart from proper kecks (nice soft cushion on ya bum shorts/trousers/leggings), in my opinion, you don't really need 'proper' cycle tops, I get away with M&S. Much cheaper. Mary – you said you don't really need proper cycling tops – 'need' and 'desire' are two totally different things!! I have already got rid of tops i no longer like. I would never spend the amount of money on 'normal' clothes but when for cycling different rules apply! My wife has a differing view though! Good read and that Giant looks v nice. Enjoyed the freedom cycling gave as a kid. Then teenage came + outgrew cheapo no gear, flat bar duffer. Early 20's borrowed mates tourer for a couple of months. Very kind. A revelation! Enthralled at the comfort, lightness and 10 gears. 23 bought 10 speed black Raleigh road bike. Campag gears, Weinmann Brakes. Enjoyed it. Read Richard's Bicycle Book, enjoyed it more. Had kids + gradually,increasingly used Mountain Bike. Got rid of Raleigh road bike. Bought Hardtail Giant Yukon mtb. Forgot to mention, now 50 something, a few mates have gone dewey-eyed and 'done up' and old steel frame british racer. Most enjoyed the project but few ride them. The modern bikes are just so much better. Hi how have you got one with the rapid, I am looking at either the defy or the rapud for my 12 miles each way commute.